Take I-95 South towards Miami. Take the exit from 95 to 195 east. Exit immediately on right to Biscayne Blvd. Take Biscayne Blvd to NE 23rd St and turn right. 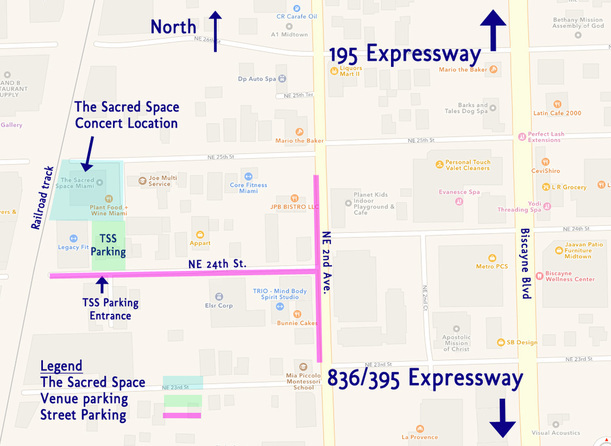 Turn right (north) onto NE 2nd Ave. Make your first left onto NE 24th St and the entrance to the venue parking lot is on your right at the end of the street. Take South Dixie Highway/US-1 North. Continue on I-95 North. Take the exit to 395 west. Get off 395 at exit 2B (Biscayne Blvd). Turn left at the traffic light (NE 2nd Ave.). Continue on NE 2nd Ave to NE 24th St. The entrance to the venue parking lot is on your right at the end of the street. Metrorail/Metromover – Take Metrorail to the Government Center Station. From there take the Metromover to the Adrienne Arsht Center stop. Then take the Biscayne Trolley to NE 24th St. Then walk 2 blocks to the west to the venue. Metrobus – Downtown Miami is served by numerous bus routes, with many stops located near the venue. Tri-Rail – South Florida’s commuter rail provides convenient train service to Miami from Palm Beach and Fort Lauderdale. Transfer from Tri-Rail to Metrorail at the Metrorail Transfer Station. Take Metrorail to the Government Center Station. From there take the Metromover to the Adrienne Arsht Center stop. Then take the Biscayne Trolley to NE 24th St. Then walk to blocks to the venue. The Venue charges $5 for valet parking at the venue. The other parking option is street parking. The 'Park by Phone' zone is 40315 in case you want to pre-program the zone to expedite your parking process. The cost for this is $1.75 per hour.